Looking For Deals On Well-Loved Cuban Cars? ¡Revolico! We love seeing those old cars from Detroit (and Moscow) down on the Cuban street, but did you ever wonder what they're worth to the owners? Courtesy of the Gray Lady, we've discovered the "Cuban Craigslist." ¡Más Abajo En La Calle De Cuba! 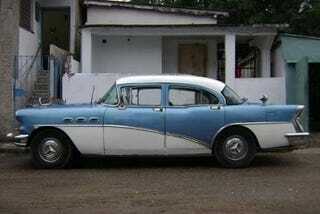 You'll find a '56 Buick for 7,000 CUC (the CUC is the "convertible" Cuban peso, roughly equivalent in value to the US dollar), for example. How about a '50 Dodge sedan, or maybe a '56 Rambler American with a Volga 24 engine? Of course, you might prefer to have your Volga engine powering an actual Volga, or perhaps a pimped-out, Chernobyl-era Moskvich is more your speed (note that the Moskvich is the same price as the Buick, which just seems Wrong. You fans of English Fords can even find a '59 Ford Zephyr… but you'll have to part with 14,000 CUC to drive it away.